I’m so glad to be bringing you this box actually on May 1st! So I open the box to find bright yellow paper, this is such a happy colour anyway and reminds me of sunshine! 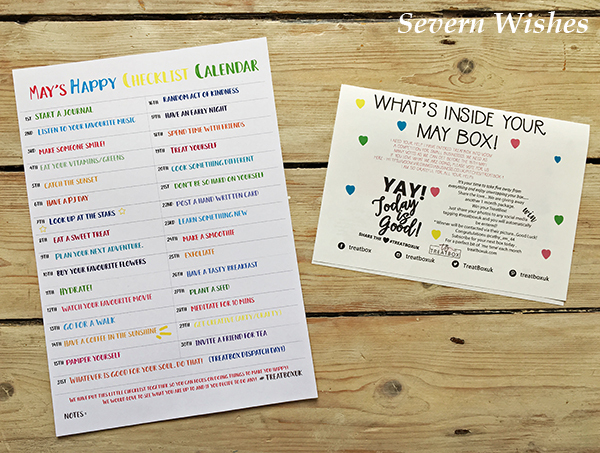 In this month’s Treatbox we see a theme of Personal Happiness. 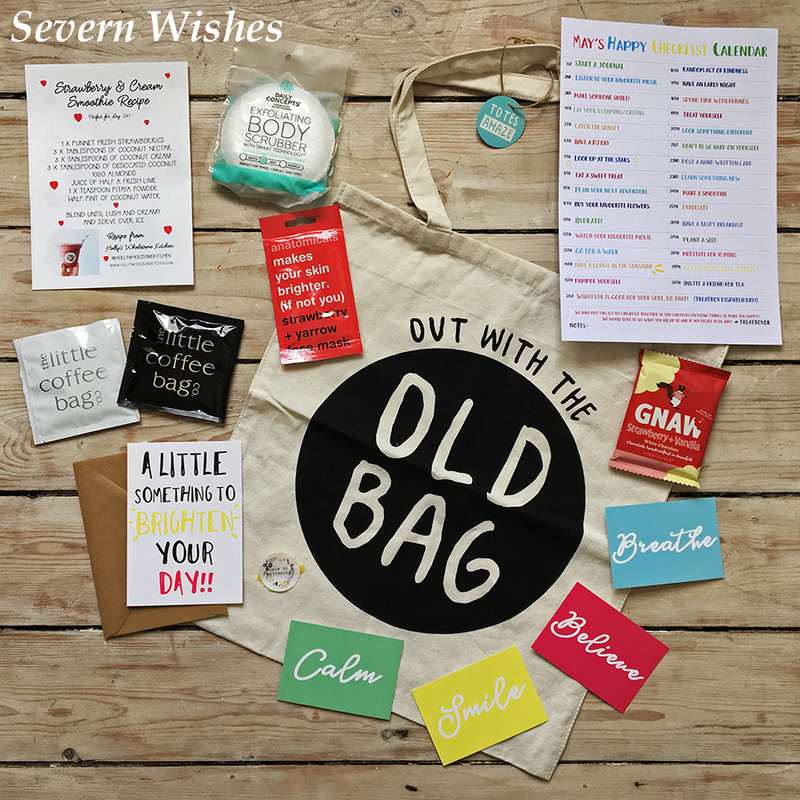 This theme is enhanced by a Checklist Print which has been arranged to incorporate the items we have received inside the Treatbox. Clever! I like new ideas! Here is my list of all the items in the May 2018 Treatbox. As always there are some slight variations in the types and in the colours, usually people get a slightly different combination inside their box. Inside the May month’s box there are 7 flat items plus 6 physical items. You’ll understand when you see my list and reveal photograph. 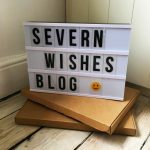 A great idea for this month’s box, tick list and ways to make your day positive. 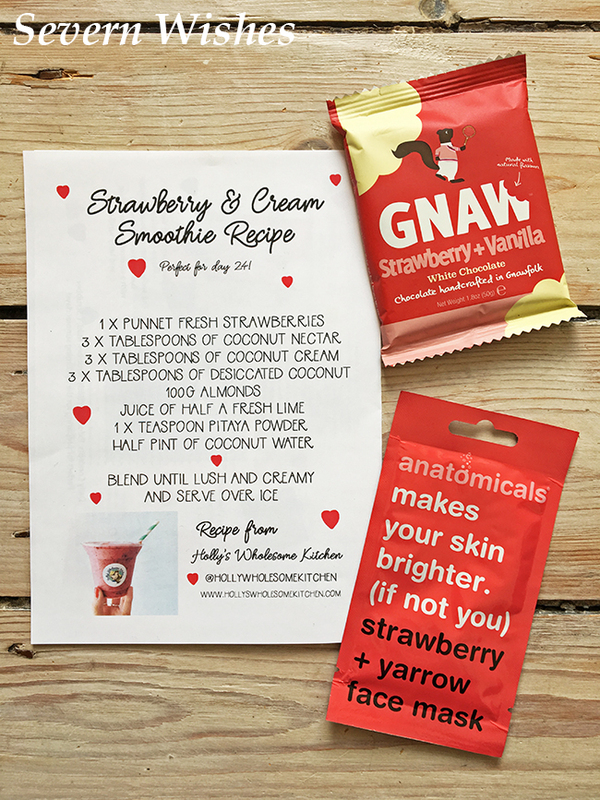 I will have to adjust this smoothie recipe so that it doesn’t include any nuts, but happy to try it then! I love smoothies in the summer months especially if it’s hot! I am very much looking forward to trying this chocolate. it’s made in the UK as well which is great! A decent serving of 50g I may have to eat it in two parts! This face mask looks like it will not only smell good but do my skin some good too. Once I have used it I will update this section. 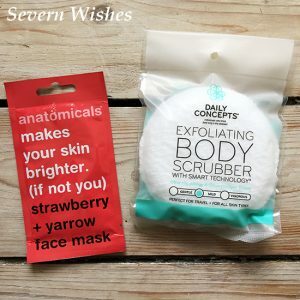 I don’t use an exfoliator very often but with summer coming up I may try it out. 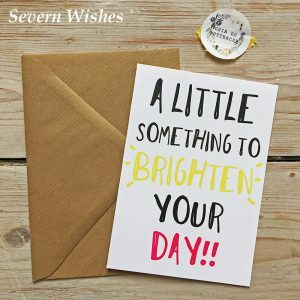 A lovely little card which can be sent to someone to, well, brighten up their day! You could create something lovely inside this card because it is left blank for us to do so. Once my husband has tried this coffee I will update this sentence. 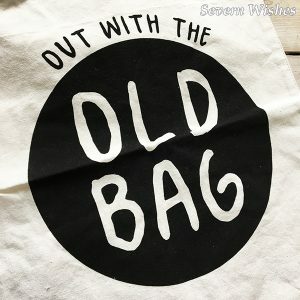 This tote bag feels like it’s good quality material and is quite a substantial size which is great too. I believe it to be a cotton blend which means you should be able to machine wash it on a gentle and low temperature setting if it were to get dirty. 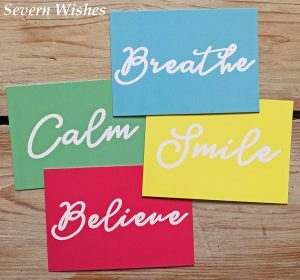 These little cards are fabulous for my blogging, for flat lay images and for affirming moments during a hectic day. I love how colourful they are as well, they really brighten up whatever you’re looking at with them on. My favourite pieces from this box are the Inspirational Affirmation Quote Cards, the Face Mask, Calendar Checklist and the Chocolate Bar. I love that they are mainly UK companies, I also love the quality of the majority of the ingredients in this box. I will be reviewing some of the items and those opinions will be added underneath the images of the products as and when I try them. This Treatbox is a bit different this time but I have really liked it! I look forward to progressing though the checklist and I will no doubt share my thoughts on my social media as the month goes on. I really liked the theme for this month and that the whole box was just a little bit different. It’s always nice to have something new, the face mask and the chocolate are products made in the UK as well. And if you didn’t know by now, I am hugely supportive of local and United Kingdom based businesses. Something else I liked was the way the theme was used throughout with the use of the new calendar idea. It gives you an excuse to use the print and the products from the box too! It gave you some good ideas for other days of the week as well, and you could always mix it up a bit and do several on one day if you wanted to! So the Decaffeinated Coffee Sachet will be passed on to someone who can thankfully enjoy it. It looks like (from Zoe’s description page) that the Caffeinated Coffee Sachet just contains Arabica Coffee Beans and should be fine for my husband to drink. When he has tried it I will update the review part of this blog post with his opinion. 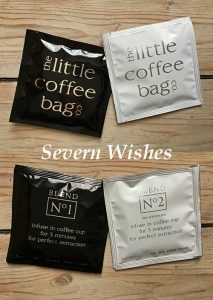 I must say i am disappointed there was no information supplied on the coffee sachets, if Zoe had not written the blurb in the description we never would have known and this could have caused a reaction. Everything should come with ingredients on them in my honest opinions. Zoe has since contacted the manufacturer of the Coffee Sachets (Little Coffee Co.) and they say that there are no nuts used in their coffee, however the flavouring is that of Walnut for the Decaf blend we received. Anything of a nutty flavour can trigger anaphylaxis in those with severe allergies so even though the coffee claims to have no actual physical traces of nuts, the flavour can still be enough to make my husband unwell. Thank you for joining me for this reveal and unboxing today, and I hope that you enjoy the video if you choose to watch it! Have a great month of May everyone! 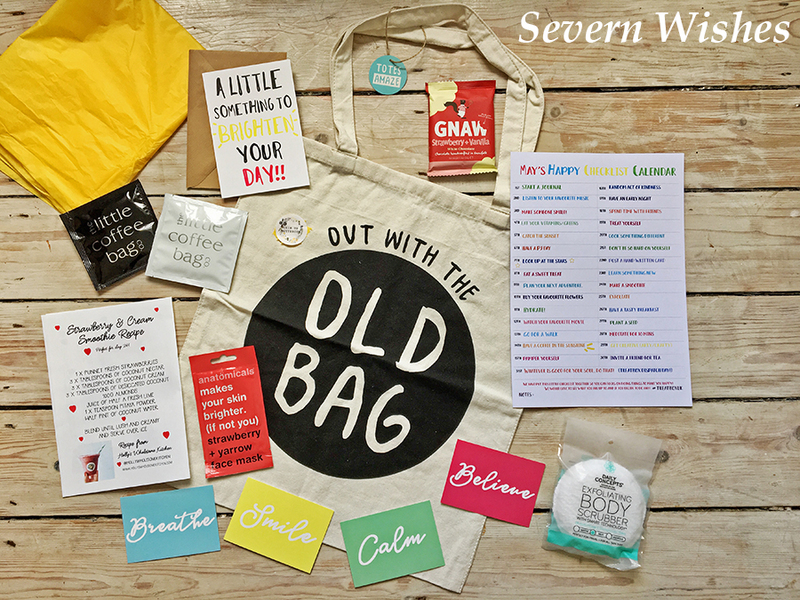 This entry was posted in Food & Drink, Lifestyle, Photography, Reveals, Reviews, Treatbox, Unboxing by Sabrina. Bookmark the permalink.